You may ask " What are Flexflops ?" Flexflops are the first "Emergency" flip-flop that folds in half and comes packaged in a makeup-style pouch. There are Flexflops for special occasions (Valentine's Day, weddings), special people (Mother's Day) and special treats (pedi time and spa days). If you have your own special idea they will even create a custom design for your Flexflops pouch - silk-screened or in rhinestuds - sweet personalized gifts for a wedding party or girls' retreat.There have been many of times where I have been out running errands and decide to have a pedicure and then realize I have my tennis on. I will be keeping these in my car so next time I do not have to drive home in paper flops. 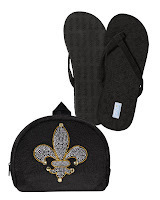 Flexflops will also come in handy for people that travel and do not like to walk barefoot in a hotel room. Just pack these in your suitcase and problem solved. What a cool idea! So simple but so useful! Can you see the manicure/pedicure/spa stores selling these! What a great "girls night out" gift bag idea, or bridal party... the gifting ideas are endless with this!